The unverifiable legend of Smith Wigglesworth, the early-20th-century preacher who raised 14 people from the dead. Worshippers at the Angelus Temple in Los Angeles, one of the many churches Wigglesworth visited. After Smith Wigglesworth died in 1947, doctors are said to have found that some of the bone on each of Wigglesworth’s knee caps was missing. Later, in his house, others found two indentations, about a foot apart, on the wooden floor of a corner room. Wigglesworth, it was surmised, had spent a lot of time there knelt in prayer. Is this story true? Who knows. But it belongs to the pantheon of Wigglesworth stories, a man who is said to be responsible for countless healings and the raising of 14 people from the dead. A former plumber who traveled the world preaching, Wigglesworth was among the key early preachers of Pentecostalism, whose practitioners are known in some circles as “holy rollers,” so named for the behavior of early adherents, some of whom literally rolled on the ground in spiritual ecstasy. Today, Wigglesworth remains an important inspiration for the modern Pentacostal movement, and nearly an entire cottage industry exists selling Wigglesworth writings and biographies. He helped define one of the most iconic aspects of the religion, namely, speaking in tongues. It might surprise some to know that practice, seemingly endemic to the American South, was in part popularized by a Brit. Or that Wiggleworth’s laying-on-of-hands had a surprise element: His healings could be incredibly violent. Wigglesworth was born in 1859 in Yorkshire, England, to a poor family, later training to be a plumber and marrying Polly Featherstone in 1882. According to at least one account, one of his first healings was of himself. Tired of taking salts to ease his hemorrhoid problem, he anointed himself with oil and prayed on it. The hemorrhoids disappeared. In 1907, he said he spoke in tongues for the first time, and spent the next six years establishing a church in Yorkshire known as the Bowland Street Mission. In 1913, his wife Polly died. 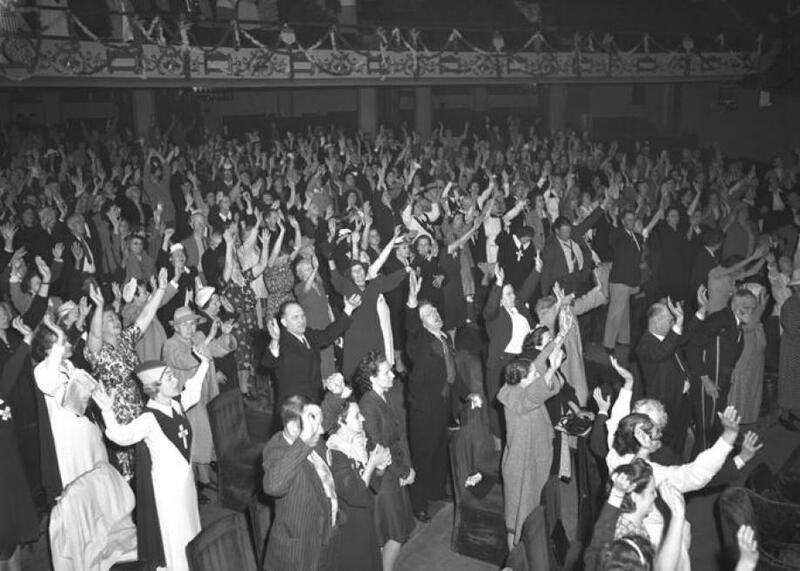 Wigglesworth traveled to the U.S. for the first time the following year, launching his international ministry that eventually took him across the world. However, Wigglesworth’s real calling card was something that’s all but lost in the modern Pentacostal faith: healing, which, for him, was a combination of prayer and violence. Wigglesworth believed that any sickness was actually the devil inside of you, which meant that prayer was needed, but also, frequently, a physical assault. There are many such stories: the time Wigglesworth punched a sufferer of stomach cancer in the stomach, the times he violently shook those on their deathbeds, or, more commonly, the times in front of crowds when healing was in part dependent upon delivering a good hard slap. Take this account from the Foursquare Crusader, an early Pentacostal periodical, which described Wigglesworth at a service at the Angelus Temple in Los Angeles, when he visited in July 1927. When this man prays for the sick he gets right down to business. He rips off his coat and rolls up his sleeves. Lifting his hand to heaven he cries. “Are you ready!” If assent is given, he “lays hands upon the sick” and prays: then, with a cyclonic movement of the hands over the afflicted part or a resounding slap that can be distinctly heard) throughout the auditorium, he declares that they are “free,” and commands them to stoop and bend over or to run up and down the aisle, as the case may be. His methods are spectacular, strenuous, and often humorous, but the results seem to justify the means, for at the close of the service when he asks all those who have been healed to stand, literally hundreds leap to their feet. Just before the meeting began, we had noticed that a young girl, with crutches, was coming in. She was assisted by a man and woman. Her legs absolutely dangled, with the feet hanging vertically from them. From her waist she seemed to be limp and powerless. Room was made for her in the front row. When the invitation to be saved was given, she attempted to go forward aided by her assistants. Brother Wigglesworth, on seeing her start, said, “You stay right where you are. You are going to be a different girl when you leave this place.” When the rest had been dealt with Brother Wigglesworth turned to the girl and, having been told her trouble, said to the people, “This girl has no muscles in her legs; she has never walked before.” He laid his hands on her head and prayed and cried, “In the name of Jesus Christ, walk!” Looking at her, he said, “You are afraid, aren’t you?” “Yes,” she replied. “There is no need to be. You are healed!” he shouted. “Walk! walk!” And praise God she did – like a baby just learning! Twice she walked, in that characteristic way, the length of the platform! Glory to God! When we left the room, her crutches were lying on the seat, and on reaching the sidewalk we saw her standing, as others do, talking with two girl friends. Often, the healings were too common to go into that level of detail. Take this description in the Pentecostal Evangel, from 1935. A man with cancer on his face and hands was healed almost instantly. A woman with hernia of 17 years’ standing was completely delivered. A man with asthma of 8 years’ standing was saved and healed instantly. A lady was healed of deafness and afterwards heard clearly. And in the days before cellphone cameras, the plausibility of faith healing was only limited by your imagination. Was Smith Wigglesworth a specially anointed agent of God? It was hard to say, exactly, but there wasn’t any evidence proving that he wasn’t. Faith healing could also be a powerful draw. Wigglesworth eventually took his act to Australia, India, Switzerland, and Finland, among a rash of other places, often greeting crowds of hundreds. His legend followed him, too, though his gatherings were mostly ignored by the mainstream press, which meant few objective observers were along for the ride. The best accounts of Wigglesworth’s life are his own and that of Stanley Frodsham, a friend and eventual biographer, whose Smith Wigglesworth: Apostle of Faith, published in 1948, is the foundational text for the Wigglesworth legend. Wigglesworth was not able to heal all of those around him. In the early years, swaths of Pentacostals rejected modern medicine, instead entrusting their health to God, and Wigglesworth was no different. Perhaps as a result, there were several maladies in his life that no amount of prayer seemed to be enough for, like his daughter’s deafness and his own battle with kidney stones. He also, of course, couldn’t prevent his own death, at the age 87, passing on March 12, 1947, in England, while attending the funeral of a close friend. Or that’s at least according to the myth.